Imprimatur – Mar Makil Mathew , Vicar apostolic of Changanasseery,Mar Menacherry John,Vicar apostolic of Trichur,Mar Pazheparambil Alosious .Vicar Apostolic of Ernakulam. Impirimatur - Mar Makil Mathew , Vicar apostolic of Changanasseery,Mar Menacherry John,Vicar apostolic of Trichur,Mar Pazheparambil Alosious .Vicar Apostolic of Ernakulam. The ancient Syriac (Aramaic) chant tradition is one of the identity markers of the Syro-Malabar Church in Kerala, India. Preservation of these chants should go hand in hand with adaptation of Indian classical and semi-classical styles of music in liturgy. Article written by Joseph J. Palackal ,published in St. Mary's Forane Church Souvenir, Pallippuram, India, pp. 71-77. Language: Malayalam. Article written by Dr. Joseph J. Palackal published in Kudumbadeepam (March 2003), pp. 6-8, 14. Language: Malayalam. Fr. Proksh SVD (1904-1986) was one of the pioneers in adapting the bhajan style of music in Catholic worship in India. In the 1960s, Dharmaram College and the National Biblical Catechetical and Liturgical Center (NBCLC), Bangalore, gave leadership in creating an "Indian liturgy" that adapted Hindu terminologies and Indian classical music. Although Indian liturgy has lost popularity, Christian bhajans continue to have currency among the Catholics in Kerala. Kudumbadeepam (March 2003), pp. 6-8, 14. Language: Malayalam. Publisher - Sathyadeepam, vol. 74, p. 5. 2nd edn., vol. 15, edited by Stanley Sadie, John Tyrell. London: Macmillan Publishers, pp. 736-37. A composite genre of poetry, music, and dance, popular among the Catholics of Goa and the neighboring regions of the west coast of India. As the official journal of the Society for Ethnomusicology, Ethnomusicology is the premier publication in the field. Its scholarly articles represent current theoretical perspectives and research in ethnomusicology and related fields, while playing a central role in expanding the discipline in the United States and abroad. Aimed at a diverse audience of musicologists, anthropologists, folklorists, cultural studies scholars, musicians, and others, this inclusive journal also features book, recording, film, video, and multimedia reviews. Peer-reviewed by the Society’s international membership, Ethnomusicology has been published three times a year since the 1950s. Puthen paana (പുത്തൻ പാന) -A Musical Study. An analysis of the intercultural processes that influenced the singing styles of Puthen paana, an eighteenth-century Malayalam poem by John Earnest Hanxleden, in the historical context of Christianization and religious colonization in South India. Director: Barbara L. Hampton. (ProQuest ID: 740455261). Related Chapters- Kerala Jewish Music ( p. 949). Kerala Tribal Music (p. 950), Tamil Nadu Christian Music. (pp. 921-927). This chapter explores the Syriac chant traditions among the group of South Indian churches, collectively referred to here as the “St. Thomas Christians.” These churches, which encompass a variety of denominational communities in Kerala, trace their origins to the apostolic and Chaldean/East Syriac sources of West Asian Christianity, later articulating also with the Antiochene liturgy and Orthodox Christianity in the late seventeenth and eighteenth centuries. They have defended their linkages with the Syriac liturgical and musical traditions against the incursions of foreign Catholic and Anglican missionaries, and later a wider variety of Catholic and Protestant movements within India. The chapter suggests that they accomplished this, in part, by only selectively accepting musical, liturgical, and theological elements that arrived with each of these missions. But more recently they have accomplished this by retaining Syriac chant melodies even as churches began to sing in vernacular languages such as Malayalam. A unique Marriage Invitation of Wilson weds Rekha printed in Syriac along with English. 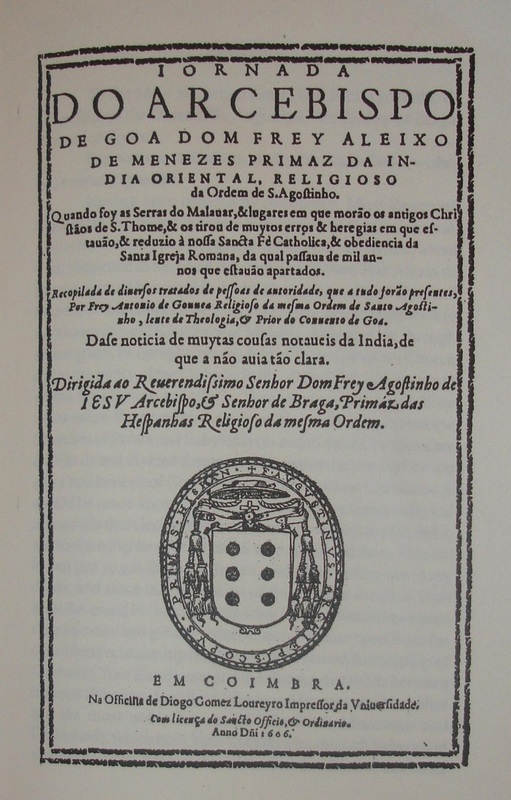 Printed at Coimbra, Portugal by Diogo Gomez Loureyro, in 1606. Printed at -Mar Thoma Sleeha Press, Aluva, 1965. The time of its being first discover'd by the Portugueses in the Year 1501. Giving an Account of The Persecutions and Violent Methods of the Roman "Prelates; to Reduce them to the Subjection of the Church of ROME. Celebrated in the Year of our Lord 1599. With some Remarks upon the Faith and Do- Urine of the Christians of St. Thomas in the Indies, agreeing with the Church of En- gland, in opposition to that of Rome. Done out of Portugueze into English. By MICHAEL GEDDES, Chancellor of the Cathedral'Church of SA R V M.
Printed for Sam. Smith, and Benj. Walfori, at the Prince's-Armi in St. Paul's Church-Yard, 1694. This letter of invitation for the Syriac Conference at St. Joseph’s Monastery at Mannanam, on 27 August 1999, is a remarkable document; the conference was in preparation for an audio recording of a selection of melodies from the Syriac music repertory of the Syro Malabar Church. The recording took place at the Monastery chapel, where these melodies reverberated on a daily basis from the middle of the 19th century until 1962. The recording would eventually be published as a CD by PAN records in Netherlands, under the title "Qambel Maran: Syriac Chants from South India,” in 2002. The CD became a landmark in the history of Christian music in India. This happened to be the first commercial release of Syriac chants from the East Syriac tradition of the Syro Malabar Church. Surprisingly, the CD became a commercial success, went into three reprints, and found a place in many libraries around the world. After spending a few hours of discussions, Fr. Antony Vallavanthara, CMI (1942-2008), who was a zealous promoter of the Syriac heritage, drafted the letter, which was sent to a selected group of CMI priests who were either Syriac scholars or singers. The participants included such significant personalities as Fr. Abel Periyappuram, CMI (1920-2001) and Fr. Emmanuel Thelly (1925-2015), CMI. The purpose of the conference was to determine which melodies should be recorded. An audio recording of this workshop has survived; it will be posted later. Contrary to my expectation, the participants were very enthusiastic and the discussions were vibrant. The closing paragraph in the letter is noteworthy. Though not a musician, Fr. Vallavanthara, a specialist in the history of the Syro Malabar liturgy , writes like a musicologist; he refers to many musical aspects of the Syriac tradition, including the importance of individual and regional variations of the same melody. Fr. Vallavanthara's words to the prospective participants are remarkable: "It is a very important contribution of yours to the Malabar Church and to "music traditions of the world." Those words were prophetic. May his soul rest in peace, and may he continue to intercede for the success of the Aramaic Project. Printed at - Jubilee Memorial Presss Seminary-Puthenpally, Varappuzha. This is the original edition (1929) of one of the most popular versions of the Stations of the Cross in Malayalam. The 32-page booklet (6.4” X 3.8”) contains hymns, prayers, and meditative reflections on each of the fourteen Stations, written by late Fr. Joseph Mawunkal, a member of the Arch-diocese of Ernakulam-Angamaly, in Kerala. At the time of publication, the author was a seminarian, identified as Jose L. Mawunkal, at Puthenpally, Varappuzha. The work received a warm reception from the Catholic Keralites because of its high literary and poetic qualities. Until the 1970s, this was the most popular Stations of the Cross among the Syro Malabar Church and the Latin Catholics in Kerala. Even today, several communities continue to use this version, with slight change of words in the opening stanza. The words kṛūšum thāngi-pōya took the place of kḷēšāwaha- māya, and fit well into the melody. Fr. Mawunkal composed the lyrics to the meter and melody of two songs that were already popular among the Catholics in Kerala: Dēwēšā yēšuparā or īšoyē enpithāwē. The opening words of these songs are indicated above the first stanza,in brackets. It is possible that these two songs were modelled after popular Hindi movie songs. Writing lyrics to popular melodies from Hindi movies was prevalent until the 1960s. See many more examples in another Malayalam hymnal, Dhaṛmagīti (see no. 13 under Resources for Researchers The title of the booklet deserves attention. It is a combination of the Syriac word slīwā (Cross) and the Malayalam word pātha (way) according to the rules of the Malayalam syntax. Although Syriac literacy was already on the path of decline among the laity in the first quarter of the twentieth century, many Syriac words remained in the vernacular prayer vocabulary. More importantly, the centuries-long presence of the Syriac language in the region created the comfort level of the Syriac Christians in formulating phrases that combined Syriac and Malayalam words. This is but one example. The advertisements that appear on the back cover will be of much interest to the historians of Malayalam hymnals and prayer vocabulary in Kerala. The first advertisement is for a Malayalam book that contains prayers and songs for the popular devotion of Eucharistic adoration, one hour adoration on the first Fridays of the month as well as forty-hour adoration once a year, in parishes.The advertisement specifically mentions the Syriac and Malayalam versions of the songs for the Benediction of the Blessed Sacrament. These songs are given in the Malayalam script. It is interesting to know that this book included also Latin chants (Pange Lingua, Tantum Ergo) in the Malayalam script. Personally, I have a vague recollection of my aunt (father’s sister) singing Tantum Ergo from this book at the end of our family prayer. It means that the Syriac Christians were quite comfortable in singing Latin chants (at home) that the Portuguese missionaries introduced in Kerala. We do not know yet if the Latin chants were ever sung in Syro Malabar Churches.The second advertisement is for a three-part hymnal that the author edited: Bhakthagānamālika (Garland of Devotional Songs). Part III consists of 73 songs,probably written by Fr. Mawunkal, and Part I was going for a second edition, according to the advertisement. The booklet is also a contemporary witness to the numeric literacy of the Keralites. The page numbers appear in Arabic numerals, whereas the number of the Stations and stanzas appear in the Malayalam numerals. During this transitional period, the Keralites were familiar with both systems of writing the numerals.The Malayalam numerals went out of vogue in the second half of the twentieth century. So, too, the price is given in the name of the local currency (chakṛam and aṇa; later this changed to rūpa and paisa). I hope future researchers will be successful in locating the books that are mentioned on the back cover; they are primary source materials for the musical aspect of the religio-cultural history of Kerala. NOTE: Fr. Emmanuel Thelly, C. M. I. (1925-2015) was kind enough to give me this copy of the paper that he presented at the Symposium Syriacum VIII, Eigh-th International Congress for Syriac Studies, held at the University of Sydney, Australia from June 26 to 30, 2000. Fr. Thelly spent innumerable hours at the archive at St. Joseph’s Monastery at Mannanam to gather the information that is presented here. This is a golden treasure for researchers on an array of topics, ranging from language and linguistics to music and history. I hope these manuscripts are still intact at the archive. Recently, the monastery has decided to digitize the materials at the Archive and make them public. That will be a great boon to scholars around the world. I cherish the sacred memory of Fr. Thelly, who helped me immensely during research for my doctoral dissertation on Syriac chants at the Graduate Center of the City University of New York, and pray for his continuous blessings on the Aramaic Project and anyone who is involved in Syriac studies. By Rev. Fr. Thomas Arayathinal, M. O. L.
This hymnal is a witness to a period (1950s to 1970s) in the history of Christian music in Malayalam, when composers of lyrics looked up to film tunes in Hindi, Malayalam, and to a lesser extent, Tamil, and wrote Christian lyrics to the meters and melodies of popular film songs. These songs reached Kerala through the government sponsored All India Radio.. The hymnal also shows the intersection of commercial movies and Christian worship at this time in Kerala, India. The hymnal was intended for private use at Dharmaram College, the Seminary of the religious congregation of the Carmelites of Mary Immaculate that the saintly Palackal Thoma Malpan (1780-1841; my collateral ancestor),Porukara Thoma Malpan (1799-1846), and Saint Kuriakose Elias Chavara (1805-1871) founded in 1831 in Kerala. The title of the hymnal takes after the Sanskrit name of the seminary, Dharmārām, which literally means “garden of virtues.” In the 1960s, over two hundred seminarians lived and studied at one point in time at Dharmārām, The hymnal was in use until the 1970s. There are 133 songs of which 130 are in Malayalam and the other three are Syriac chants printed in Malayalam script. The songs are grouped under 12 headings: Hymns in praise of Jesus: songs 1-38 Hymns in praise of Blessed Virgin Mary: 39-65 Christmas songs: 66-74 To the Holy Spirit: 75-79 To St. Joseph: 80-86 St. Thomas the Apostle: 87-93 St. Theresa of Avila: 94-100 St. John of the Cross: 101-105 St. Theresa of Lisieux: 106-110 The patron saints of different residence buildings of the Seminary Songs for various occasions: Syriac chants for the Benediction: 117-118 Litanies: 120-124 - Stations of the Cross 125 Hymns to the Holy Spirit: 126-128 Stations of the Cross 125 Hymns to the Holy Spirit: 126-128 The Lord’s Prayer: 129 Hail Mary: 130 Hymn to Mary: 131 Dedication to the Holy Spirit 12. Malayalam translation of the Latin chant Te Deum: 133 The tune is indicated in parenthesis below the title by the opening words of the film song to which the lyrics are written;in some cases, the name of the film in which the song appears is also mentioned. The number of stanzas and the number of verses in each stanza coincide with those of the film song. These songs were not part of the official liturgy of the Syro Malabar Church, they were sung during such paraliturgical services as the Holy Hour (adoration of the Blessed Sacrament), Benediction, prayer gatherings, litanies and novenas to saints. The hymnal lacks an Introduction. Hence, we have no information on the thought process that went into its preparation and publication.What is conspicuous by its absence are the names of the lyricists. It is possible that a few of those hymns were written by the talented students at the seminary. Some of the hymns were popular among Catholics all over Kerala. The preparation of the hymnal took place during the time when the Syro Malabar Church was engaged in translating the liturgy from Syriac to Malayalam. The inauguration of the Malayalam version took place on July 3, 1962, one year before the publication of this hymnal. The inclusion of the Syriac chants shows the continuity and comfort level of the worshippers with the Syriac language and chants. Two of the three Syriac chants (117 &118) are translations of the Latin chant Pange Lingua by St. Thomas Aquinas (1225-1244). The third one (65), šlām lēk (“shanti to you (Mary]”) is a chant in honor of the Blessed Virgin Mary. The community used to end the night prayers with a hymn to the Blessed Virgin. This Syriac chant was sung on that occasion.. Interestingly, there is only one instance of using a melody from a Tamil film (38); Tamil is the language of the neighboring state of Tamil Nadu. Yet, the Christians in Kerala were more tuned to the film songs in Hindi, the language of the distant north. One reason may be that All India Radio. stations in Kerala gave greater importance to Hindi songs than Tamil songs, and cinema theaters in Kerala screened comparatively more films in Hindi than Tamil . This hymnal is a case in point for an uncanny musical interface of commercial movies and Christian worship in Kerala. The Catholics were quite comfortable in celebrating their faith by singing secular melodies with their visual connotations. The hymnal also portrays the poetic imagination of a particular period in the history of Christian lyricists in Kerala, and bears a testimony to the theological thinking and prayer vocabulary of the time. Finally, this hymnal documents the names of a number of popular songs and the names of films in which they appear, indicating cross cultural communication within the country. Lyrics:- Fr. Abel, C. M. I. Printed at :- Mar Louis Memorial Press, Ernakulam, Kerala. 1969. This book is a valuable addition to the resources for researchers on the Christian music of Kerala, India. It tells the story of the meeting of the musical minds of two great men: Fr. Abel Periyappuram, CMI (1920-2001) and Mangalappilly M. Jose (d. 2010), popularly known as Rafi Jose. Their collaboration happened in the 1960s at Ernakulam, Kerala. That was the time of transition of the Syro Malabar liturgy from Syriac to Malayalam. Drawing inspiration from the ancient Syriac liturgical texts, Fr. Abel wrote lyrics in Malayalam for the Holy week services, Benediction of the Blessed Sacrament, Christmas midnight service, as well as prayer services for the beginning and end of the calendar year. This was also the time when Fr. Abel pooled the best musical talents in the greater cochin area and formed the Christian Arts club, which eventually would evolve into Kalabhavan. Mangalappiily Jose was one of those gifted musicians; he had already become immensely popular by singing the Hindi film songs of Muhammad Rafi (hence the nickname “ Rafi Jose). Fr. Abel tested his talent as a composer by entrusting the new lyrics to Rafi Jose. Rafi Jose composed captivating melodies to those lyrics that became instantly popular. (These melodies continue to be sung in the Syro Malabar churches until this day). The gramophone company of India published a record that included two of Rafi’s compositions: “thālathil weḷḷameṭuthu” (for Maundy Thursday) as well as “gāgulthā malayil ninnum” (for Good Friday). These soulful melodies were heard from the public address systems of most of the churches in Kerala and became imprinted in the minds of the people of Kerala. Meanwhile, Fr. Abel and Rafi Jose embarked on an unusual project of publishing this book (printed at Mar Louis Memorial Press at Ernakulam, in 1969) with the lyrics and music of their songs in Western staff notation. The book is a monument to their great talents, their musical collaboration, and their intention to enhance Western musical literacy among musicians in Kerala. In the absence of an Introduction, we do not know who transcribed the melody in staff notation. To clarify this, I had a telephone conversation with Rex Isaacs (18 August 2016), who was closely associated with Christian Arts Club and, later, Kalabhavan. Rex is a violinist in the Western tradition and comes from a family of musicians. Rex told me that he assisted Rafi Jose in preparing the score of the melodies of “thālathil weḷḷameṭuthu” and “gāgulthā malayil ninnum” as well as the background music for those melodies, before they traveled to Madras (Chennai) for the audio recording at HMV studio. Rex reiterated that the transcriptions that are printed in the book are not his. He thinks that Mr. Patrick David, who knew Rafi Jose, very likely prepared the score that is printed in the book. Rex added that he could not understand the reason for the addition of a bar line after the time signature on the opening staff, and then a measure-long space and bar line at the beginning of subsequent staves. In any case, the score helps us to understand the melody as the composer envisaged it; it also helps us to understand how a great singer like K. J. Yesudas emotes with and interprets the melody, and gives it a different life. I happened to see the book, by chance, during a visit to the music library at Nadopasana at Thodupuzha, that I started in 1986. This was in the first week of August 2016. While browsing through the collection of recordings and books, Fr. Kurian Puthenpurackal,CMI, the director of Nadopasana brought a set of books from his personal collection. Gānādhyāpakan was one of them. I was overjoyed to see the book, and immediately recognized its historical value. Fr. Puthenpurackal said that he got the book from Fr. John Kachiramattom, CMI several years before. Ironically, this book and its content never came up in my conversation with Fr. Abel, during my three years at Kalabhavan. The book assumes another layer of importance at the present time. It offers a definitive answer to the recent disputes regarding the authorship of the melody of "gagultha malayil ninnum " The dispute arose after the publication of an article (“gāgulthā malayil ninnum”), on Rafi Jose by Shajan C. Mathew in the Sunday edition of Malayala Manorama Daily, on March 27, 2016. In the article, Shajan Mathew cited much evidence to support the authorship of the melody by Rafi Jose Another living composer, however, disputed Shajan’s findings and claimed authorship of the melody. The Christian Musicological Society of India gladly presents the pdf version of the book for the benefit of scholars and journalists as the final proof of the authorship. May the soul of Rafi Jose have the last laugh, and rest in peace! Gagultha malayil ninnum Mathew, Shajan C. “Gāgulthā Malayil Ninnum” (Malayalam, From Mount Calvary). Malayalam Manorama, Sunday, 27 March 2016, p. xi. Chants sung by Fr.Paul Nilackal Thekkethil. Recorded at Oasis Digital Studio, Ranni, Kerala on 18-19 Feb 2012. In this recording, electronic tamburu was used for sruti; in actual service organ, keyboard, or harmonium is used for accompaniment. Published by Department of Sacred Music and Communications, The Mar Thoma Syrian Church, Thiruvalla (2002). Pp. ii + 757. Contains notation of over 484 melodies from the liturgy of the Mar Thoma Church. Certain significant details regarding the structure of the lyrics (pallawi-anupallawi-charanam, for example) and meter are missing in this edition. For these and other important information on the hymns, researchers may consult Malankara Mar Thoma suriyani sabha parasyaradhanakramam (Order of Public Worship of the Malankara Mar Thoma Syrian Church), published by the Mar Thoma Sabha Publication Board, Thiruvalla. A call-to-attention to the rich repertoire of the Mar Thoma Syrian Church can be found in Palackal 2005, pp. 123-125. Puratanappatukal (Ancient Songs (of the Syrian Christians of Malabar]) by P. U. Lukas. Compiled by P. U. Lukas (Puthenpurackal Uthup Lukas). 10th ed. Kottayam: Jyothi Book House. 2002. First published in 1910. Pp. xxxiv + 240. This book includes the complete text (pp.142 - 155) of the songs of Marggam Kali. Die Melodien des Chaldaischen Breviers Communenach denTraditionen Vorderasiens und der MalabarkÃ¼ste, edited by Heinrich Husmann. Orientalia Christiana Analecta, no. 178. Rome: Pontificum Institutum Orientalium Studiorum, 1967. Part I: Die Melodien des Commune des Chaldaischen Breviers, ach der tradition des vorderen orientes. Gesungen von P. Ephrem Bede, Chaldaischer Chorbischof, Patriarchalvikar in Kairo. Part II: Die Melodien des commune des Chaldaischen Breviers, nach der tradition der Indischen christen der Malabarkuste. Gesungen von P. Amos C. M. I., Generelakonom des Ordens Carmelitarum Mariae Immaculatae, Prior Generalâ€™s House, Ernakulam, Kerala. The CD, Qambel Maran: Syriac Chants from South India contains six chants (tracks 19 to 24) from an interesting repertoire of texts that were translated from Latin into Syriac in Kerala during the Portuguese period. These texts were composed anew in Kerala, mostly for paraliturgical services. See a preliminary study of the Syriac version of the famous Latin chant Pange Lingua by St. Thomas Aquinas, in Palackal (2005: 112-117). These chants are reference points for a special period in the history of Christianity and Christian music in India . Kerala Kaldaaya Suriyaani Reethile Thirukkarmma Geethangal by Fr.Mathew Vadakel and Fr. Aurelius. Kerala Kaldaaya Suriyaani Reethile Thirukkarmma Geethangal (Liturgical hymns of the Chaldeo-Syrian rite of Kerala), edited by Fr. Mathew Vadakel and Fr. Aurelius. Syriac texts transliterated in Malayalam script; music in staff notation. Printed at Codialbail Press, Mangalore. Published by S. H. League, Aluva. 1954. See Cover page and Table of Contents. The Syriac-Malayalam Hymnal, edited by Rev.Saldanha A, S. J.
Manuscript of Syriac chants in staff notation by Fr.Aiden Kulathinal, C. M. I. Copied in 1948 from an earlier manuscript (now lost) by Fr. Aiden Kulathinal, C. M. I., at St. Theresa's Monastery at Ampazhakkadu, Kerala. So far as we know, this manuscript contains the earliest transcriptions of model melodies from the liturgy of the Hours in the Chaldean rite of the Syro-Malabar Church, India. The 27 pages are divided into three sections: pages 1-14 contain 51 Syriac melodies from the Hours; pages 15-19 consist of notation of what looks like Western melodies (to be verified) without text underlay; and pages 20-27 contain Marian litanies in Latin with Syriac translation. The Syriac texts are written in Malayalam script. The original copy is at the library at Acharaya Palackal Jeevass Kendram, Aluva, Kerala. See more details in Palackal 2005, pp. 134-135. Letter written by Fr. Aiden Kulathinal, C. M. I. to Joseph. J. Palackal. Devalaya Geethangal (Malayalam, Church hymns), edited by Fr. Basselios of St. Theresa, T. O. C. D.
The book contains text of Syriac hymns for various occasions, for the use of the church choir. A large number of hymns are translations of Latin chants that were composed anew in Kerala. Names of translators and composers of the melodies are unknown. The text is printed in Malayalam script, indicating that Syriac literacy was on the wane among the lay people in the Syro-Malabar Church, by the end of the 19th century. on July 25, 2018 at 4:00 pm. History of Syro Malabar Church! "We sing from the Divine Music Built in Us" - J. Palackal CMI. Venue: Whitall Pavilion, Jefferson Building, 101 Independence Ave. SE, Washington, D. C., 20540. Documentary presentation followed by a discussion with the producer of the film Rev. Dr. Joseph Palackal held on Feb-16-2017 . at Mar Valah Syriac academy , St. Thomas Mount, Kakkanad, Kochi . To purchase Digital copies, please click here. Releasing of the CD version of "Christian Bhajans" and "Kristu Sahasra Namam"
The book assumes another layer of importance at the present time. It offers a definitive answer to the recent disputes regarding the authorship of the melody of "gāgulthā malayil ninnum." The dispute arose after the publication of an article (“gāgulthā malayil ninnum”), on Rafi Jose by Shajan C. Mathew in the Sunday edition of Malayala Manorama Daily, on March 27, 2016. In the article, Shajan Mathew cited much evidence to support the authorship of the melody by Rafi Jose Another living composer, however, disputed Shajan’s findings and claimed authorship of the melody. The Christian Musicological Society of India gladly presents the pdf version of the book for the benefit of scholars and journalists as the final proof of the authorship. May the soul of Rafi Jose have the last laugh, and rest in peace! During my high school days at St.Albert's High School (1961 - 1964) in Ernakulam, I happened to meet M. F. Jose (a.k.a. “Rafi Jose”) who was mainly known as a skilled soccer player in the Senior School Team. His musical talents were hidden from himself and the public; he never participated in musical competitions oryouth festivals.It was Raju Michael,a classmate of Jose,who initially discovered the hidden talent in Jose, and went out of the way to mold him into an accomplished singer who specialized in rendering popular Hindi film songs sung by Mohammed Rafi. During those days, the musical scene at the Ernakulam-Kochi area was a vibrant one.The leading music clubs were Azad Art's Club and Tansen Music Club at Ernakulam, and Oriental Music Club, at Cochin.Right from our school days my elder brother,Emile, and I used to participate in the concerts of Azad Club due to the patronage given by Job&George,the duo composers,and violinist Alfred D'Souza who used to take violin lessons from my Dad.It was indeed a privilege and an exhilarating experience to meet such talented singers asC. O. Anto, Zero Babu, and J. M. Raju, and be part of a professional orchestra whose members were renowned in the field of music. Oriental Music Club under the leadership of violinist,Terrence D'Souza,had a group specialized in the performance of Hindi film songs;M. G. Baby and Stella were the lead singers.Even when the leading clubs in Ernakulam refused to give due recognition to M. F. Jose,it was Oriental Music Club that gave him a red carpet treatment and christened him as Rafi Jose, based on his special vocal capacity to emulate the tone of the famous singer, Mohammad Rafi (ironically, it was the same club that refused to promotethe young singer, K. J. Yesudas, who eventually became a national hero, because of his “deplorable” Hindi diction). Very soon, Rafi Jose became well known in and around Ernakulam and Cochin,and received invitations to sing on special occasions.The musical nights that Goldwin and Hussaier organized were known for their high standards and meticulous perfection.Rafi Jose's rendering of Hindi songs was the highlight of these shows. It was around this time(mid 1960s) that Fr.Abel Periyappuram, C. M. I. (1920-2001)started a musical institution called Christian Arts Club within the premises of the Ernakulam Arch-Bishop's Palace on Broadway.The main goal of the club was to assist the vernacularization of the Syriac liturgy of the Syro Malabar Church.Fr.Abel roped in great composers like V.Dakshinamurthy,Job&George,Gopalan Master, and M. K. Arjunan.But somehow Fr. Abel was not so comfortable with working with them, and was in quest for some young talent,probably, from his own Catholic community, the Syro-Malabar Church.Atlast, he found Rafi Jose who had a hybrid heritage of Latin and Syrian. Soon, Jose started proving his skills as a composer, and Fr.Abel was more than pleased.But how to propagate these compositions,was the big question. Fr.Abel had no contacts with the musicians in Ernakulam or Cochin.Neither was he a musician himself to assess the ability and proficiency of a good musician.So he requested Jose to bring in some "good, disciplined and God fearing young musicians" to fulfilhis mission of recording and disseminating the new songs. Thus, it was through Jose that Fr.Abel got in touch with the instrument players from the Ernakulam and Cochin areas.At the early recording sessionswe used to have only a few instruments.I remember Jose himself on the harmonium,my younger brother,Eugene on the guitar,A. G. Varghese on the Tabla,his younger brotherA. G. John on the bongos, and myself on the violin.For bigger sessions we used to hire more musicians from the troupe of K. J. Yesudas.The singers at the beginning were V. T. John(who recently retired as the chief librarian at S. H. College,Thevara),Lissamma,Neena and Soya.Later on, Jolly Abraham,Gopan,Thambi,Ibrahim,Shanthamma,Vijayam et al. joined the bandwagon.Nuns, priests, and laymen from various Syro Malabarchurches thronged to the Christian Art's Club to get recorded copies of these songs. Seeing the enormous enthusiasm, Fr. Abel proposed a novel idea of conducting Bible Ganamelas with the intention of further propagating his works.We devoutly worked toward that goal, but the outcome was disappointing.Even in the couple of churches that we performed, the response was lukewarm.So we convinced Fr. Abel about attracting audiences by having the second half of the concert with hit songs from the Hindi films. Although this had a tremendous impact initially, more and more requests poured in strictlyfor film songs. Around this time, K. K. Antony master, a great musician and exponent of the Carnatic classical music, came back to Kerala from his successful sojourn in Sri Lankaand made acquaintance with Fr. Abel. With his deep knowledge in Carnatic music,superior composing and pedagogic skills, and extremely polite behavior,Antony Master very soon became Fr.Abel's close collaborator. Maybe, his Syro Malabar roots, too, did the magic. With the advent of Antony Master, Fr.Abel's attitude toward Rafi Jose changed for the worse.Jose was completely side tracked and all the importance was given to Antony Master.I was actively involved in the recording sessions of Antony master’s songs, too. I felt the pain of Rafi Jose, and even told Fr.Abel about how miserable Jos felt when he was ignored all of a sudden. Fr.Abel was a clever manipulator.Knowing fully well the relationship between K. J. Yesudas and I, and my brother, Emile,he requested us to somehow get Yesudas affiliated to his Christian Arts Club.Both of us were part of Yesudas's orchestra during those days. Hence we had no inhibitions in asking Yesudas for such a favor.After some initial resentment,Yesudas agreed to our request.It was in late 1969, if I remember correctly,that Yesudas attended one of our committee meetings. Many VIPs attended that meeting just because they came to know Yesudas would be in attendance. Yesudas expressed his willingness to be part of the institution on condition that the name Christian Art's Club be replaced by a secular name.Fr.Abel was clever enough to instantly poke Yesudas’s brain to come up with a suitable name.And Yesudas came out with the name KALABHAVAN.That was accepted with a thunderous applause. That is when the Song and Drama Division of the Govt.of India landed in Ernakulam to recruit musicians.The interviews and auditions were held at St.Teresa's College auditorium.Jose opened his heart to me saying that he wanted to somehow escape from Kalabhavan and even Ernakulam in order to avoid further humiliation.He requested me and my brother,Eugene,to accompany him when he sang for the audition.We readily obliged him, and the jury selected Jose.It was with tears in his eyes that he took leave of me that day. He never even told Fr.Abel about his departure,neither did Fr. Abel bother to enquire about him thereafter. With his repertoire of Mohammed Rafi’s hit songs and experience as a composer,Jose did quite well in the Song and Drama Division.After completing a ten-year contract, however, he decided to try his luck in Bombay.Although he composed music for a few Marathi Dramas, he couldn't make it in Bollywood. Meanwhile,he fell in love with a Marathi girl,Elsa,and married her.They had a son,who is now working in USA. Unfortunately Jose drifted away even from his immediate relatives in Ernakulam.He passed away a year ago.When there was a controversy in the Malayala Manorama daily, regarding the composer of Gāgulthā malayil ninnum, I had to intervene and set the record straight. A Keralite, who is a neighbor of Elsa(Jose's wife), took the paper and read the write up to her.She somehow managed to get my phone number and thanked me whole heartedly for setting the record straight.She even remarked that she never knew that her husband was such a great man who is still remembered in Kerala. All said and done, Rafi Jose shall live through the soulful melodies that are sung during the Holy Week services in the Syro Malabar communities around the world. Abel, C.M.I., Fr. and Rafi Jose. (1969). Gānādhyāpakan (Malayalam, Music teacher). Manorama, Sunday, 27 March 2016, p. xi. 1 Fr. Abel Periyapuram, C. M. I. sings Syriac melodies and their Malayalam translations from the liturgy of the Syro-Malabar Church for the research of Joseph J. Palackal. Recorded at Kalabhavan Studio in Dec 1997. 2 Fr. Abel Periyapuram, C. M. I. sings Syriac and Malayalam versions of melodies from the liturgy of the Syro-Malabar Church. Introduction by Joseph J. Palackal. Recorded on 22 July 1998 at ASA Music Productions in Mount Vernon, New York. 3 Fr. Abel Periyapuram, C. M. I. sings Malayalam version of model melodies from the liturgy of the Hours of the Syro-Malabar Church for the doctoral study of Joseph J. Palackal. Recorded at Fr. Abel's office at Kalabhavan, Kochi, Kerala on 23 Aug 2001. 4 Fr. Abel Periyapuram, C. M. I. sings chants from the liturgy of the Syro-Malabar Church. Recorded at Joseph J. Palackal's office in Maspeth, New York on 20 Sep 1997 during Fr. Abel's visit to U. S. A. Of special interest is the conversation between Fr. Abel and Joseph J. Palackal on the rhythmic aspects of these melodies. 5 K. V. Job interviewed by Fr. Kurian Puthenpurackal, C. M. I. on Puthen paana for the research on the same topic by Joseph J. Palackal (see item no.27 under 'Research'). The interview was conducted at Job Master's residence on 18 May 1992. 8 Vaasagapa on St.Anthony recorded by Fr.Michael Bhackiam (last name to be verified ?) in Tamilnadu. Exact location to be verified. 9 Traditional christian songs in Tamil recorded by Fr.Michael Bhackiam (last name to be verified ?) in Tamilnadu. Exact location to be verified. The contents are: Prayer Song Hail Holy Queen Prayer song for marriage Song on our Lady For Death Song on St.Anthony. 10 Q & A session with Dr. Joseph J. Palackal, CMI, on Christian Musicology. Rome.This is the second session of a one-day seminar on the Syriac heritage of the Syro Malabar Church at St. John Damasceno College, Rome, on 18 March 2017.